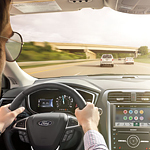 Even though the Ford Fusion is a sedan, it features numerous technology features that would make you feel as though you're in a computer room instead of a car. Stay connected with the outside world by using the FordPass Connect system that can be set up at Mossy Ford. The SiriusXM Radio offers a range of stations to listen to while you're on the road. Stay on top of your gas mileage and the distance that you've traveled with the EcoGuide. The Fusion features a few different plug-in options for powering the vehicle, such as an AutoEV mode. A mobile app can be set up so that you can monitor the charging of your car when you're not there with the vehicle. As you drive efficiently in the vehicle, the leaves that you see on the right side of the dashboard will grow. A Brake Coach offers information that can assist when you're trying to control the car and when stopping.